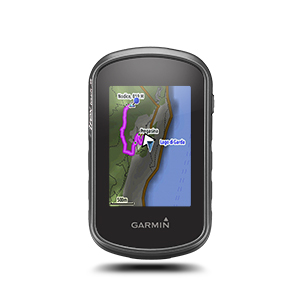 Garmin eTrex Touch 35 is a compact GPS system for use when cycling on a bike, hiking or use on a sailing boat. The eTrex has been built to withstand use in many conditions and it is waterproof to IPX7 standards. The screen is a 2.6-inch touchscreen and the battery will last 16 hours. Plus you can use AA batteries to power the eTrex Touch 35. Preinstalled maps are TopoActive European maps. Smart notifications allow you to receive texts and emails. Furthermore you can offer friends and family live tracking along your journey using the eTrex Touch 35's GPS technology in-built. 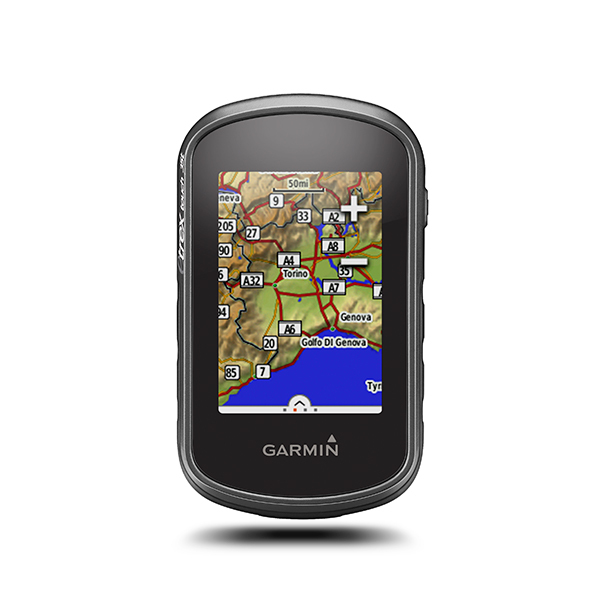 Garmin eTrex Touch 35 is a handheld device that can also be used to navigate on a sailing boat, cycling, hiking, in a car and many more applications. It has a fully rugged design and the screen is scratch-resistant. Furthermore it is waterproof to the the IPX7 standard. The screen is a 2.6-inch touchscreen making control of this Garmin GPS system device very simple and intuitive. The battery life on the eTrex Touch is 16 hours. Use either NiMH or Lithium or 2 AA batteries (easy to replace when on the move). The preinstalled maps on the eTrex Touch 35 is TopoActive European Maps. There are also activity profiles for various recreational activities; hiking, cycling, geocaching, walking, etc. You can also stay in contact with friends and family with the eTrex Touch 35 in many ways. You can share waypoints, tracks, routes and geocaches wirelessly. Plus you can use the smart notification feature know when you receive texts and emails - simply connect to your smartphone. Furthermore, live tracking offers you the feature to allow friends and family to track your progress along a journey or expedition - using Garmin Connect people can track your activity and GPS location. This is all made possible using an ANT+ sensor. Both GPS and GLONASS technologies are used in the eTrex Touch 35 Touch. This means you will get a fast GPS fix when turning on the device and also a reliable GPS signal whether you are in a valley or there are many trees about for example. The internal memory of the Garmin eTrex is 8GB and you can expand this memory using the SD card slot. For use on a boat simply use the Garmin BlueChart marine maps. For use on a bike you may want to buy Topo maps. There is a barometric altimeter that will provide accurate elevation data and an electronic 3-axis tilt-compensated compass. These features are ideal for mountaineering and mountain biking or simply walking and getting the crucial information you need in real-time. The Garmin eTrex Touch 35 will store 250,000 paperless geocaches that mean you no longer need to enter in GPS coordinates and carry around notes on paper to find where the geocache is. Further information provided by the eTrex Touch 35 Touch is hunting information, fishing information, sport watch compatible, sun and moon calendar and sunrise and sunset data. You can remotely control your VIRB XE, VIRB X and VIRB Elite action camera with the eTrex Touch 35. A cycling mount is included in the box ideal so you can use it on a bike as well as in the palm of your hand. 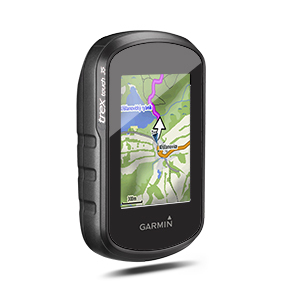 Garmin eTrex Touch 35 is preloaded with TopoActive European maps. 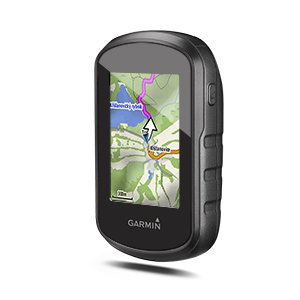 Garmin TopoActive Europe maps includes routable road, trail and path networks, waterway detail, place names, military areas, natural features, land use areas, historical sites and many points of interest (POI). Additional maps can be loaded to the Garmin eTrex Touch 35 such as City Navigator maps to provide navigation from A to B either in a car or cycling. The eTrex Touch 25 features an SD/microSD Card slot, an easy way to add new maps and mapping updates. 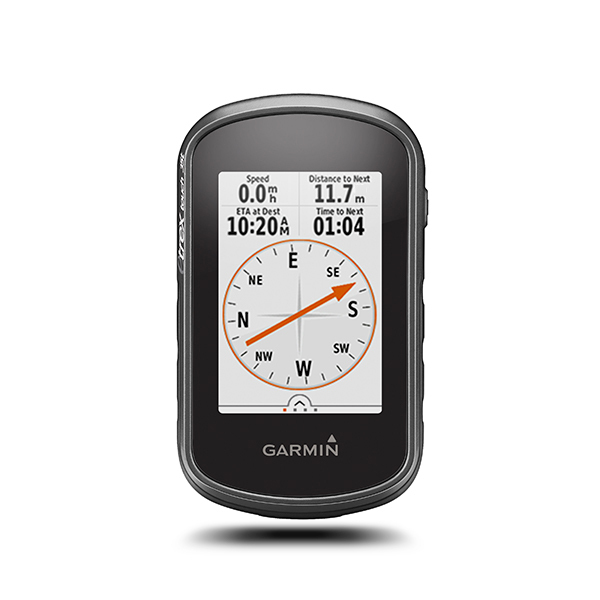 Looking for accessories to use with the Garmin eTrex Touch 35 handheld device? We sell a vast selection of genuine parts and spares including eTrex Touch 35 carry case, retractable lanyard, carabiner clip, bike mount, car mount and car charger, Garmin Tempe and chirp Geocaching Beacon. Optional Garmin maps for Garmin eTrex Touch 35 are supplied on SD/microSD Card, these include; street-level road maps - perfect for cycling of using your eTrex Touch 35 in a car, 1:50k and 1:25k Ordnance Survey maps - ideal for hiking and walking the countryside of Great Britain and marine BlueCharts - ideal if you want to navigate the waters around the UK, Europe or further afield. Answer: The unit holder of the Garmin Handheld Auto Friction Mount Kit is not sold separately. Do you have a question about the Garmin eTrex Touch 35? Submit your question via our contact page.